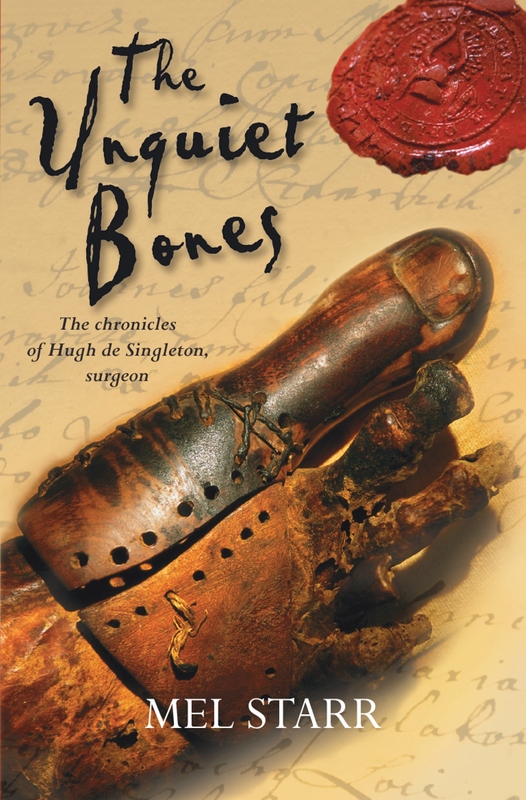 So happy today to be taking part in Historical Fiction Virtual Book Tour’s Blog Tour for Mel Starr’s THE UNQUIET BONES. If you read me regularly, you know I love historical fiction and I also love mysteries, especially cozy mysteries. This book combined both of those loves in a fun and fast read. And – it’s just the start of a series centering on this main character and his mystery solving in medieval England. Hugh of Singleton is an educated and intelligent man or somewhat noble birth (but not wealthy). He chooses to work as a surgeon after attending training in Paris and is making a small living doing this when he is called to administer to a local, powerful lord. Lord Gilbert then calls upon Hugh to solve the mystery of some bones found in his cesspool – bones that are distinctly human. Hugh sets about solving the mystery or the bones found (which appear to belong to a teen age girl) and in doing so, unearths more forgotten secrets. Will he be able to find the killer? According to Lord Gilbert, he is going nowhere until he does! I really enjoyed this book and am thrilled that it is just the first in a series. I could see this fitting so well on the BBC as a weekly series! Hugh is a likable character and the medieval setting will surely make you happy you live now! I always love to learn new things when reading historical fiction, and this book seemed very well-researched. When you think of all the things you could die from back then – things that are rather easily managed today for the most part – it does make one stop and pause (and be thankful for anti-biotics!). I found the mystery well-plotted (even though I did figure it out! ), and the extraneous characters served to move the plot along. I would love to read more of Hugh de Singleton’s adventures! Thank you so much for having me be part of the tour and for my review copy (which I swiftly gifted to my husband as I know he will love it! ).